Medicare is now going to incentivize death by paying doctors to talk with their patients and families about end-of-life care. Oh, they say this payment policy would only apply to patients and their families who choose to participate on a volunteer basis. But frankly, patients are putty in the hands of doctors. Would the death rate rise commensurate with Medicare payments to physicians over end-of-life issues? Says the doctor, according to algorithms your loved one doesn’t have a fighting chance to survive. For example, the 5-year survival rate for pancreatic cancer is a dismal 2%. Yet most patients fight on believing they have a chance of beating their cancer. Doctors and hospitals are all too willing to accommodate desperate patients and their families and bill insurance along the way. To tackle this problem of futile care health care planners devised hospice care for the dying. But wouldn’t you know it, hospice care just ended up adding to the total medical bills, not saving money. Now this author has always been critical of modern medicine, especially how hospitals and doctors run up the bill and get in all the insurance billings they can before a patient dies. But there is another side to this story that reaches beyond greedy doctors and hospitals and desperate patients and their families who are left to pray for miracles. How do doctors know with certainty you are going to die? How do doctors really know there is no hope for these so-called terminal patients? I have heard many stories where doctors withdrew all the medicines from a terminal patient and unplugged all the machinery and the patient surprisingly recovered and lived a long time. Was it the over-medication and the dungeon-like hospital rooms that were preventing healing and recovery? Modern medicine is so given over to commercial interests, treating every disease as if it were a drug deficiency and utilizing the most expensive invasive treatments while other less costly and more effective cures are neglected. The predominant role sunshine vitamin D plays in health maintenance is decades late in being recognized. Hospital rooms are devoid of sunshine, which is the major contributor to circulating vitamin D levels. Vitamin D was initially described as an essential nutrient for bone health. Only recently has it been extolled for brain development and mood, immunity, muscle and heart strength, and many other functions. Most patients are admitted to hospitals in a vitamin D-deficient state, making them prone to hospital-acquired infections and other sequelae. Cancer is certainly a devastating diagnosis if for not other reason than there is no cure for cancer though there are myriads of approved treatments that at best prolong life by a few months. An exceptional quality of vitamin D is that it may not reduce the occurrence of cancer but certainly reduces the risk of dying from cancer. As the blood concentration of vitamin D declines among cancer patients their risk of dying dramatically increases. [BMC Cancer March 8, 2015] Cancer patients housed in dungeon-like, sunless rooms will certainly experience a decline in their vitamin D levels. Image credits: Canadian Medical Association Inc. Chest radiography, November 1996, about 1 month after intravenous vitamin C therapy was started. 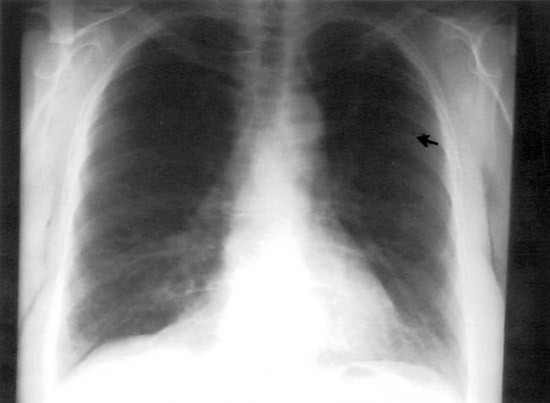 Cannonball lesions are evident in both lungs, as indicated by the arrows and lines. 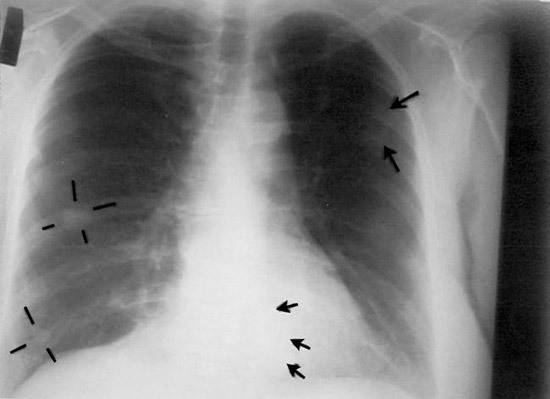 Chest radiography, June 1997, showing shrinkage of tumor masses; the arrow indicates one residual abnormality. 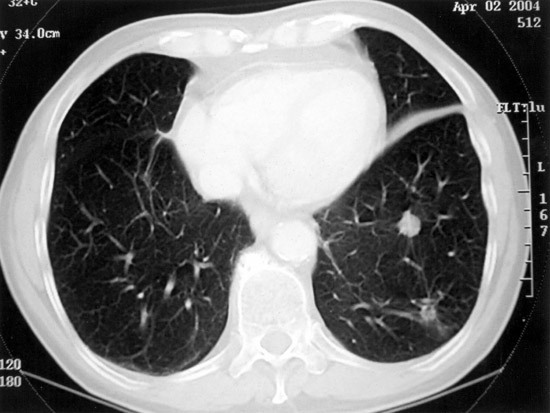 (CT) scan performed on July 24, 2000 reveals two large masses in the lower left lobes of the lung. 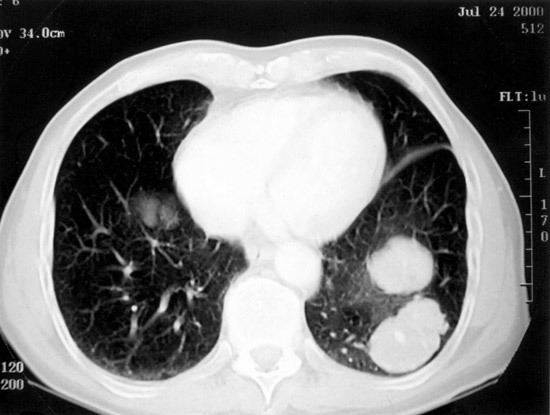 CT scan performed on April 2, 2004. Tumor masses in lower left lobe are greatly diminished in size. It went 50-grams for a day, zero for a couple of days, 6 grams for a couple of days then 10-grams. He was making steady recovery on 10-grams a day – starting to sit up etc. Then they stopped the vitamin C completely because of loose stools without telling me. He died 2-days later before we could get the vitamin C reinstated. The stupidity was tragic – literally! Will your physician be recommending vitamin C, vitamin D, fish oil or vitamin B1 to your loved ones with hopeless terminal diseases? I sincerely doubt they will. Doctors say nutritional therapy is unproven, but it is certainly not disproven. Even if these nutritional therapies are of marginal benefit, they are non-toxic and inexpensive. Even if just palliative (relieving pain or alleviating other discomfort) they would serve Medicare patients better than expensive toxic therapies. Why is conventional medicine so reticent to conduct more convincing larger studies that employ nutritional therapy especially among terminal patients who have little or no hope? You can see from the evidence presented here, by not putting nutritional science into practice they are already culling the population and reducing Medicare costs by neglectful attrition. –©2015 Bill Sardi, Knowledge of Health, Inc.